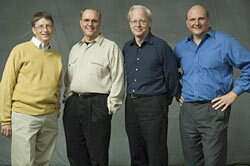 Bill Gates holds 977,499,336 shares of MSFT as on 14th Feb, 2006. His net worth is more than $50 billion. Late Thursday, when the financial markets closed for the day, Bill Gates announced his decision to retire from Microsoft in 2008 to focus his attention on philanthropy via $29 billion Bill & Melinda Gates Foundation, aimed at fighting infectious disease (hepatitis B, AIDS, malaria) and improving high schools. Ray Ozzie, Microsoft's Chief Technical Officer, will immediately assume Gates' title as Chief Software Architect. Bill Gates will continue as the chairman of Microsoft after transferring his duties over a two-year period. Ozzie will continue to report to Gates for some more tim during the two-year transition period and then shift to reporting to Ballmer. Experts think that Ozzie has the management skills to bring much-needed discipline to the vast software development organization and he has a fresh perspective that might make Microsoft a more innovative company.